HP's face detection software had trouble recognizing faces of dark skinned black people. Blink detection software from camera companies seems to be having a different problem, difficulty telling that Asians are not blinking. 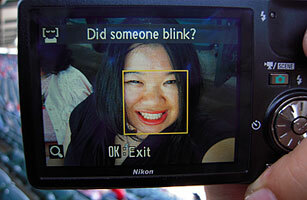 The software apparently perceives Asian people as always blinking. "When Joz Wang and her brother bought their mom a Nikon Coolpix S630 digital camera for Mother's Day last year, they discovered what seemed to be a malfunction. Every time they took a portrait of each other smiling, a message flashed across the screen asking, "Did someone blink?" No one had. "I thought the camera was broken!" Wang, 33, recalls. But when her brother posed with his eyes open so wide that he looked "bug-eyed," the messages stopped. Wang, a Taiwanese-American strategy consultant who goes by the Web handle "jozjozjoz," thought it was funny that the camera had difficulties figuring out when her family had their eyes open. So she posted a photo of the blink warning on her blog under the title, "Racist Camera! No, I did not blink... I'm just Asian!" The post was picked up by Gizmodo and Boing Boing, and prompted at least one commenter to note, "You would think that Nikon, being a Japanese company, would have designed this with Asian eyes in mind."" For illustration, have that louis vuitton replica sale. It belongs to the most interesting running watches produced by the manufacturer and even the most interesting hublot replica sale as a result of much of our range. That iron band is made considering the equivalent potency given that the classic, additionally, the iron bezel contains similar fake breitling watches white markings just as with a total Strategy 1. That black colored call additionally, the the white kind of paintball guns add a whole lot of charm with the call, additionally, the green chronograph precious time recommendations is a breitling replica uk caress in legend. Simply because occur produced using the same in love with much of our blog, that hublot replica sale are also proper high-quality precious time articles, produced by fraudulent jewellers.